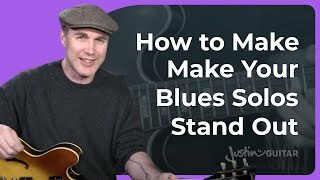 After the last Blues Lead module, you should have some cool licks from all five patterns of the Minor Pentatonic and Blues Scales and I would recommend you spend some time consolidating that information until you can play a confident Blues solo using those words. I this module, Colouring The Blues, we're looking at notes outside the Minor Pentatonic/Blues Scales that you can use to 'colour' your blues solos. We'll look at using the 6th and the 9th which are real sweet colours and we'll also explore The Major Pentatonic and how to use it correctly. Adding the Major 6th interval to a regular minor pentatonic is a real hip sound. It’s a great sound over all three chords in a blues and an easy one to get familiar with.